001 Back to college (almost said school), so finely some outfit posts. The jumper i’m wearing here was my Mum’s from years ago, she has so many old clothes that she’s kept and it’s all coming back into fashion like velvet dresses, although i’m not to keen on them. I love this ring i brought from Topshop, it was in the sale but it hurts when i drive which is so annoying. Looking at this photos shows me how badly i need to get my hair done, i’m really considering going brown not a dark brown, just fancy a change, i’ve been blonde for a very long time. 002 I’ve decided to do another page, headed Illustrations, with the drawings i do for my college course. I don’t want them on my main page as i want to keep this fashion only. Also so you know the text that is grey means it is a link to a page or to the item i am wearing. 003 It’s the first day of winter, i cannot believe how fast this year has gone, i need to work a lot more so i have more money for christmas but it’s a nightmare i’m to tired all the time. I do need to work more since i am moving out but i’ll see how i am first. I am so excited that we may be moved in by this weekend! 004 I need to change my camera still this Samsung ST61 is awful, it is so slow, it freezes and the self time does not work even though when i took it back to the shop it worked. So i’ve had to record a video to show them it doesn’t work. I’m defiantly going to take it back tomorrow. 005 Also if you’ve not done so please subscribe to my Youtube account. Love your nails + outfit. Thanks for your sweet message on IFB. Yes I'm on bloglovin and of course google friend connect. Following you now, follow back? 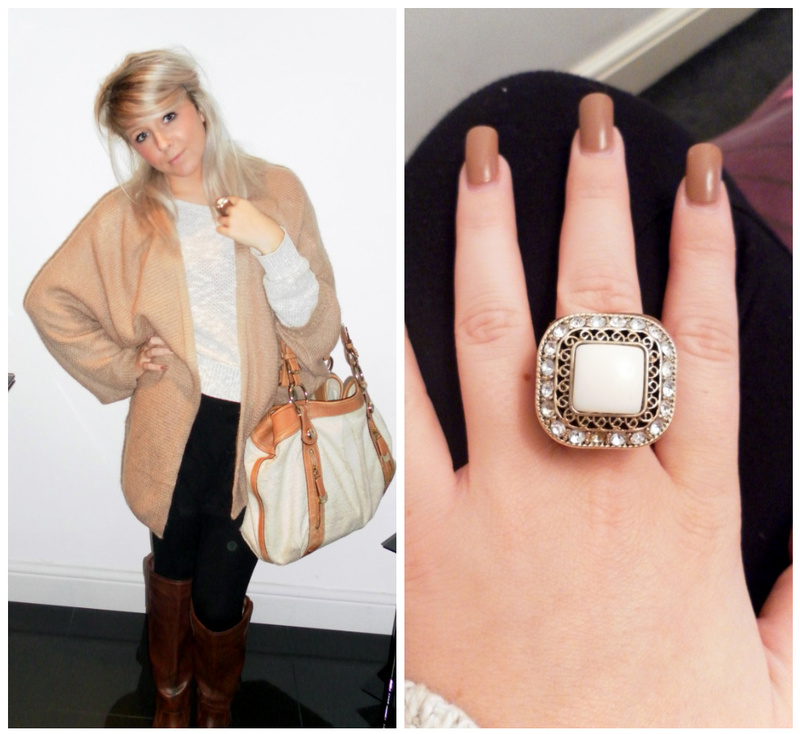 You look very chic..I especially love the ring and cardi. Fun outfit! fantastic look! i love mixing brown and black- you pull it off so effortlessly.